France; Late 15th Century. Latin Text; Gothic Script. This manuscript leaf came from a Book of Hours, sold probably at one of the famous shrines to which wealthy laymen made pilgrimages. To meet the demand for these books, the monastic as well as the secular scribes produced them in great numbers. The freely drawn, indefinite buds here entirely supplant the ivy, fruits, and realistic wayside flowers which characterized the borders of manuscripts of the preceding half century. The initial letters of burnished gold on a background of old rose and blue with delicate white line decorations maintain the tradition of the earlier period. The vellum is of silk-like quality that often distinguished the manuscripts of France and Italy. The text block is ruled in red, and the main ink is a dark slate color. The formation of the letters, both in shape and in position above the ruling, gives them a slightly insubstantial quality, and there are a large number of copying and grammatical errors. The blue ink used for the decoration is especially vivid. 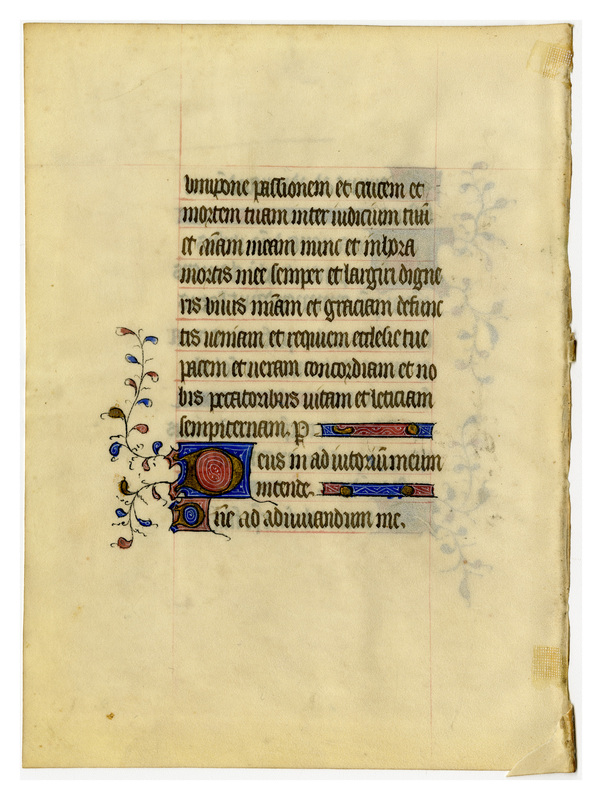 Text: This leaf contains text from the Hours of the Cross at nones and into vespers. The text of the leaves from this manuscript clearly demonstrate that it accords with the Use of Paris, for which see the excellent resources at CHD, the Center for Håndskriftstudier i Danmark, online at http://www.chd.dk/tutor/index.php. Jesus Lord at the ninth hour his spirit forth did send: crying Eli and his soul to father did commend: with a lance a soldier did pierce through his tender side: the earth then trembled and the sun his shining light did hide. Ant. We adore thee O Christ, and we bless thee. For that by thy holy Cross thou hast redeemed the world. Prayer. ...set thy passion, cross, and death between thy judgment and my soul, now, and in the hour of my death and vouchsafe to grant unto me grace and mercy: to the living and the dead rest and pardon: to thy Church peace and concord, and to us sinners life and glory everlasting. Through. Hora nona Dominus Iesus expiravit: Hely clamans spiritum patri commendavit: latus eius lancea miles perforavit. Terra tunc contremuit, et sol obscuravit. Ant: Adoramus te Christe, et benedicimus tibi. Quia per sanctam crucem tuam redemisti mundum. Oro. vivi, pone passionem, crucem, et mortem tuam inter iudicium tuum et animam meam, nunc, et in hora mortis meae: et mihi largiri digneris gratiam et misericordiam: vivis et defunctis requiem et veniam: Ecclesiae tuae pacem et concordiam, et nobis peccatoribus vitam et gloriam sempiternam. Per. 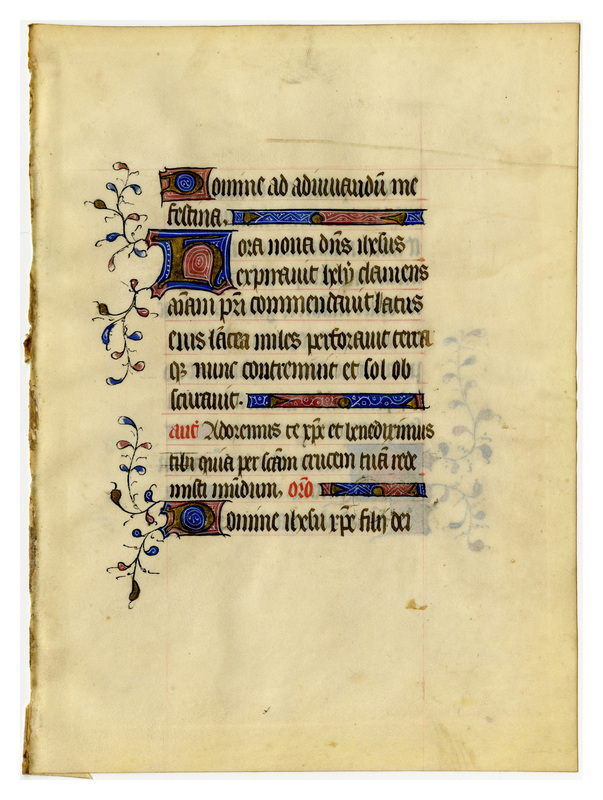 “E0045 Leaf from a Book of Hours (Horæ Beatæ Mariæ Virginis),” Digital Exhibits | Denison University Archives & Special Collections, accessed April 23, 2019, http://exhibits.denisonarchives.org/items/show/65.